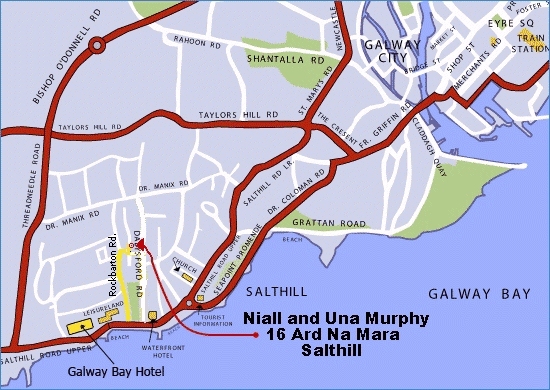 Niall Murphy's home/office is located at 16 Ard na Mara, Salthill, Galway! The phone number is 091 860732, in case you get lost. Drive to the Prom in Salthill. From the Prom turn onto Rockbarton Road, which is the road beside Leisureland swimming complex. You now have the entrance to Leisureland on your left and a large lawned park on the right (the People's Park). Take the next right turn - there is a sign for Ard na Mara on the wall. Take the next left turn - there is a Cul de Sac sign. We are directly opposite the entrance to the school.